(4) Mr. [Daniel] Moore having stated that Mr. Babbage would be willing to deliver a course of lectures on Astronomy, he was introduced by Mr Moore to the Board and stated that he would be ready to commence a Course of Lectures on Astronomy on Thursday the 16th of February next- the terms of which are 12 lectures for 50 guineas and after that rate in case the course did not consist of that number. (2) Read and approved the minutes of the Committee of Accounts of this day and signed an order for payment of the following sum, vizt. He was only 23 when he delivered them. 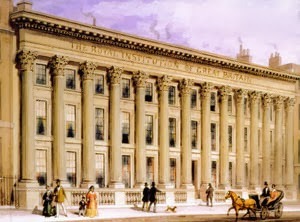 The Royal Institution of Great Britain, to give it its full name, was founded some 15 years prior to this through the joint efforts of Count Benjamin Rumford and Sir Joseph Banks. They had intended it to have been a kind of college for the education of artisans and apprentices, to teach them the latest skills in and the application of the sciences to technology and the arts. However, not long afterwards it gave up this philanthropic purpose. Owing to a lack of funds the board of managers opted to turn it instead into an institution for the presentation of popular, public lectures on science for middle class, fee-paying audiences. Both Sir Humphry Davy and Michael Faraday were launched upon their scientific careers at the Royal Institution. Sir Humphry Davy, in particular, was one of its first public lecturers and it was especially he who popularised its function as a platform for promoting science. These lectures on Astronomy were perhaps the only public lectures which Babbage ever gave, and they form probably the only instance where he practised the art of public speaking, something which he personally detested. The only other occasions where he had to speak in public were perhaps those on the hustings of the two parliamentary election campaigns in the Finsbury constituency during the 1830s, in which he stood for the Whig cause and the reformed parliament, and lost. Babbage had many academic interests during his long life. After Mathematical Analysis Astronomy was his first love. He was perhaps encouraged in this by his close friendship with John F.W. Herschel and through him the other members of the Herschel family. He was a frequent visitor to their household in Slough and became personally very well acquainted with J.F.W. Herschel's father, Sir William Herschel. It is possible he may have acquired much of the material contained in these lectures at firsthand from the grand master himself: a great deal of the content of the later lectures clearly indicates this to be so. Babbage greatly admired Sir Wiliam, and the relationship must have been close for he was later asked, following Sir William'sdeath in 1822, to act as the executor to the latter's will. He would have certainly been introducedto all the famous astronomers of the day by Sir William, and would also have had access to Sir William's astronomical library and personal papers, and of course the many instruments and telescopes at Slough, the latest of their kind. And whilst preparing these lectures he would have no doubt debated much with the Herschels on all matters both scientific and speculative relative to the subject of Astronomy. The manuscript original for these lectures is to be found amongst the British Library's collection of Babbage's scientific papers and correspondence; these were deposited at the library by his youngest son, Henry Prevost Babbage, in 1905. They are contained in folder Add. Ms. 37203 (ff32-332), along with a few of his other papers on Astronomy. As a set they are almost complete, with the following exceptions: Lectures 9 and 12 are wholly missing, the synopsis for Lecture 7 is found in the collection but its content is missing, about one fifth of Lecture 2 has survived, together with an synopsis for it forming part of an original advertisement for the lecture, the last manuscript page of lecture 5 is also missing: otherwise the series is complete. Taken as a whole they give a very clear picture of the extent to which knowledge in Astronomy had evolved to by the beginning of the 19th century. Modern readers may find them somewhat verbose, but the ideas seem to have presented reasonably clearly. As editor I have taken a few liberties, making a number of minor amendments to Babbage's spelling, grammar and punctuation, and I also have 'modernised' one or two obsolete words and expressions in certain instances to make them more acceptable to today's reader, especially where the original meaning of a word has changed drastically during the past 173 years. Given their quality one is surprised Babbage did not arrange for their publication during his lifetime.